Time has come to start planning your New Year’s holidays, and Brazil holds the reputation of being one of the greatest places in the world to celebrate it! And that is because this is not only one of our main holidays but it has a mystic symbolism that is contagious. And of course, it is undeniably an unforgettable party time in the country! Brazilian New Year is characterized as the icon of new hope, fresh beginning and total renewal. Traditions are to everybody dress in white, the color of peace, and by the sea people give offerings, like flowers, to honor the Queen of the Sea Yemanja. And that is why for this date you must choose a beach destination. Rio is a must for anyone who wants to start the forthcoming year with style and company, but for those willing to a more relaxed environment, there are some great beach hotels in the northeast region that can be a good choice. 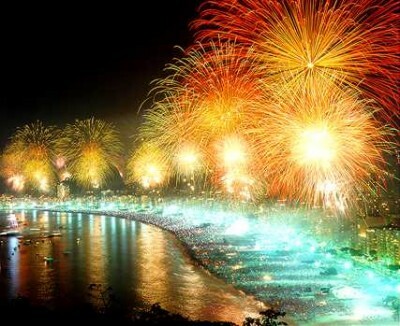 Rio is the number 1 choice due to the Copacabana huge party that attracts over 2 million people every year. At midnight, with the turning of the year, the fireworks display begins and lasts for about 20 minutes. Spectators on the beach and in the buildings along the Copacabana ocean avenue have different views to the spectacle, but share the same exciting atmosphere and cheerful spirit that only Rio knows how to provide. And you are lucky that Brazilians are always late on planning… the best beach front hotel rooms are still available. Just remember that for this period of the year, there is a minimum stay of 4 to 6 nights minimum in all of them and prices are significantly higher than on regular season. If you want to have a taste of new years in Brazil, but somewhere less busy you can chose between some of the beautiful beach resorts we recommend in the northeast. You will have the same mystic traditions, and will be able to enjoy the perfect weather of the region. Usually they have a longer minimum stay, but trust us – you will want to stay that long anyways. Wherever you choose to go, this will be a once in a lifetime experience. Count on us to help you organize the perfect experience for you – as it is a busy season with many restrictions imposed by the hotels, it is important to plan smartly!